I had the opportunity to do a nontraditional, impromptu interview with Monica Bundy of Monica Bundy Consulting, an official Business & Brunch Sponsor, to gain more insight about her business and what drives her in her career as a Lifestyle Strategist. Monica Bundy is a Raleigh, NC based Life Strategist and creator or the "Do to Done Planner" We've all heard of brand strategists and marketing strategists, but a Lifestyle Strategist? What's that? I wasn't exactly sure either so I slid in her DM's and got nosey! EK: What motivated you to start your business? MB: I initially started in Direct Sales. But I noticed the people who were coming to me for products needed more than that to sustain the results they wanted. EK: How long have you been in business? EK: What is your target client? MB: Busy professional women between the ages of 25 and 35 who are overachievers for others before herself. EK: How important is self-care for professional women? Beyond the manicures and buble baths, what aspects of life should women try achieve balance? Why is this important? MB: Self -care is extremely important because ultimately it's what replensishes us after we've poured into others. From Experience and helping women for the past 4 years, I believe women should try to create balance and reduce their stress levels first. Using tools like affirmations and also meditating helps a lot. Many don't realize how impactful our thoughts are. One reason self-care is important is because it increase self-esteem and confidence, and decreases the need to be validated by others. Self acceptance -> self love -> self-care. EK: Tell me about your planner. How does each section of the worksheet contribute in helping women be more positively selfish when it comes to managing their bust lives and their "me" time. MB: I often hear women say they're looking or hoping to find balance. But balance is something we create. It looks different to everyone. There's a section that address several areas of wellness; assisting women with being able to stay focused and "put her name/needs" at the top of her list of daily priorities. There are many of us, I'm guilty of this in the past, who schedule everything we don't want to forget to do for everyone else and often times necessities such as eating get put on the back burner. When I created the planner I wanted to provide a tool to the marketplace that fun, but effective in assisting with creating a daily routine that INCLUDES the mind, body and soul. EK: We all know about brand strategists, social media managers and business oncsultants, but we never think of a lifestyle strategist. How do your services differ from other lifestyle enhancing professionals like therapists or life coaches? Lastly, what advice would you give to overworks and overstressed business women and entrepreneurs? MB: As a Lifestyle Strategist, I teach busy professional how to develop healthy habits so they can stress less and live more because making a living isn't the same as making a life. I don't believe there's a one sixe fits all approach so in order to help my clients, I assess their lifestyle habits. First, to ensure they're aligned to reach their goals in a realistic timeframe; then, I develop an executable plan to help merge their personal and professional worlds together. MY advice for overworked and overstressed business women and entrepreneurs is invest more time in caring for yourself so you can LIVE YOUR BEST LIFE and not live vicariously through others who "appear" to be living theirs. I Want my free session with Monica! Monica is offering a complimentary Breakthrough Strategy Session to all of my readers so that You can also get your life together! I had a great time chatting it up with Monica. She had me really doing a self-evaluation on how much time I actually devote to myself. Judging by the chipped nail polish on my toe...none! Lol. So tonight I will be allotting 1 hour to use my pedicure products I bought, turn on Toni Braxton's new album and enjoy some "me" time. 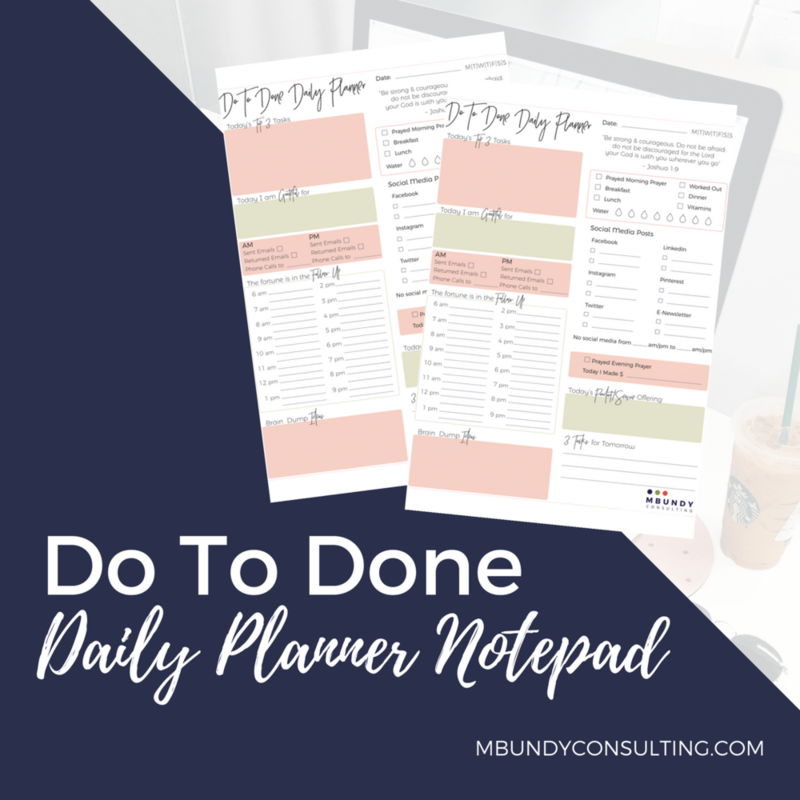 Get Your Do to Done Daily Planner from Monica Bundy ! Get my "Do to Done" Daily Planner!